Snegurochka, also known as the Snow Maiden or Snowy, is a unique character of Russian folklore and an essential part of Russian New Year’s celebrations. The origins of Snegurochka are contradictory. The roots of this feminine character can be found in Slavic pagan beliefs. According to legend, she is the daughter of Father Frost and the Snow Queen. However, another Russian fairy-tale tells a story of an old man and woman who had always regretted that they did not have any children. In winter they made a girl out of snow. The snow maiden came alive and became the daughter they never had. They called her Snegurochka. But when the summer sun began to warm the land, the girl became very sad. One day she went into the woods with a group of village girls to pick flowers. It began to get dark and the girls made a fire and began playfully jumping over the flames. Snegurochka also jumped, but suddenly she melted and turned into a white cloud. In some parts of Russia people still follow the ancient tradition of drowning a straw girl in the river or burning her on the bonfire to dispel the winter. This custom symbolizes the transition from winter to spring. 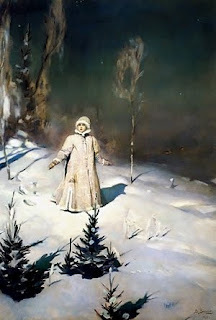 Snegurochka became widely known in the 19th century after Russian playwright Aleksandr Ostrovsky wrote the play "Spring Fairytale" based on the legend. The play portrays the young beauty as the daughter of Frost - her father -and Spring her mother. She is immortal and she stays in her father’s winter forest, but she is ready to sacrifice her immortality for the ability to feel love, like normal humans. She is suffering from loneliness and her mother generously grants her a Love Wreath made from flowers, knowing with both sadness and delight that it will warm her daughter’s cold heart and let her experience love. But as soon as she falls in love she leaves her forest and melts at dawn as the sun touches her with its rays and turns her into a cloud. Nikolay Rimsky-Korsakov’s then wrote an opera based on Ostrovsky’s play. The modern image of Snegurochka appeared at the turn of the 20th century, as Snegurochka became a popular character in children's New Year’s celebrations and theatrical performances. Little girls enjoyed being dressed up as Snegurochka by their mothers in light winter attire and sometimes a cap. Snegurochka has always been an essential part of the New Year’s celebrations and a helper to Father Frost, the Russian version of Santa Claus. Young, beautiful and smiling, she always accompanies Father Frost as he visits children and gives them gifts; she acts as a mediator between Father Frost and the children. 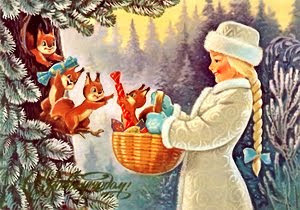 The role of Snegurochka gained more importance in Soviet times when New Year’s became an official celebration in the country. Now she is not only a helper to Father Frost but also an equal anchor of modern New Year’s parties and performances. Place of residence and contact details: She is said to live deep in the winter forest. Snegurochka's modern place of residence is quite real - it's the Russian city of Velikiy Ustug (in the original fairytale, her origins are in the Russian city of Kostroma). Nowadays, Father Frost is considered to be her grandfather rather than her father, as in the old legend. Appearance and personality: Young and beautiful. According to the legend the old man and woman who made her from snow used two deep blue beads for eyes, made two dimples in her cheeks, and used a piece of red ribbon for her mouth. Snegurochka was very beautiful, but when she came to life, she was even better. Snegurochka is often depicted with snowy skin, deep sky-blue eyes, fresh cherry lips and curly fair hair. Originally Snegurochka wore only white garments and a crown, decorated with silver and pearls. Her present day costume is blue, red, white or silver and her crown is sometimes replaced by an embroidered cap with fur edging. She is probably one of the most attractive women characters in Russian culture. Favorite means of transport: Modern Snegurochka travels with Father Frost on a horse-drawn sledge. Thank-you for the story. I have linked to it on my blog.